For some reason, installing and running EncFS on Mac seems to be unnecessarily difficult. This is what I ended up with, and it should take you about 5 minutes to set up, start to finish if you’ve already got homebrew installed. Install homebrew from http://mxcl.github.com/homebrew/. The site is pretty informative on how to do so. Open Terminal (cmd-space, type Terminal, enter, although if you don’t know where to find terminal I don’t know what business you have with EncFS). This copies the fuse4x kernel extension into the right spot. This makes the command to load the kernel module always run as root (necessary to load the module). Download and install Macfusion from http://macfusionapp.org/ (http://macfusionapp.org/releases/Macfusion_2.0.4.zip). This provides a lovely interface to mount/unmount filesystems. Finally, Download and install the EncFS For Macfusion plugin from t-haeberle.com/encfs/EncFS for Macfusion2.dmg. 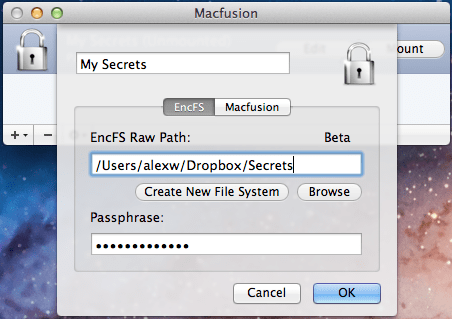 This installs EncFS support into the Macfusion GUI. (BONUS STEP) Make sure that in Finder’s preferences (open Finder, Finder>Preferences) the ‘Connected Servers’ box is checked under ‘Show these items on the desktop,’ otherwise mounted filesystems won’t appear there and will be difficult or impossible to find. From this point on you should have Fuse4X/EncFS/Macfusion all set up and ready to go! To use it, launch Macfusion from /Applications. When it opens, you can add filesystems from the + menu, as below. You can either select a folder with an existing EncFS system or create a new one. and look at the ‘name’ key to find the right one. I hope you don’t have too many entries! You can’t rename the filesystem entry once it’s created, or Macfusion looses its brain (it’ll prompt for a server password for user (null) on server (null) at the next attempted mount). The only way I can see around this is to delete the offender as in (1) and recreate it with a new name. Alternately, you might be able to edit the ‘name’ key in the FS file found in (1), but then really it’s about as much trouble either way. The version number is now 0.9.2, and -x wasn’t supported on my Mountain Lion machine. This caused step 4 to have some issues, but was able to figure it out. Thanks for the guide!